Our focus was to bring all eight departments under one umbrella to align marketing and other functions without sacrificing unique objectives. Build WordPress infrastructure for all departments. CIESC and its departments had half of a dozen websites with different domains. The first goal was to bring CIESC branding into each department, but still allow the departments to have their own website to maximize conversion and resource development. With a cleaner URL, marketing conversation rates increased. Organize Brand Design for each department that ties back to CIESC. Each department either had a dated brand strategy that didn’t tie back to CIESC or no brand at all, which made it difficult for their website users to navigate and classify the user experience. Develop and design websites that sends users along a journey to and through each departments. 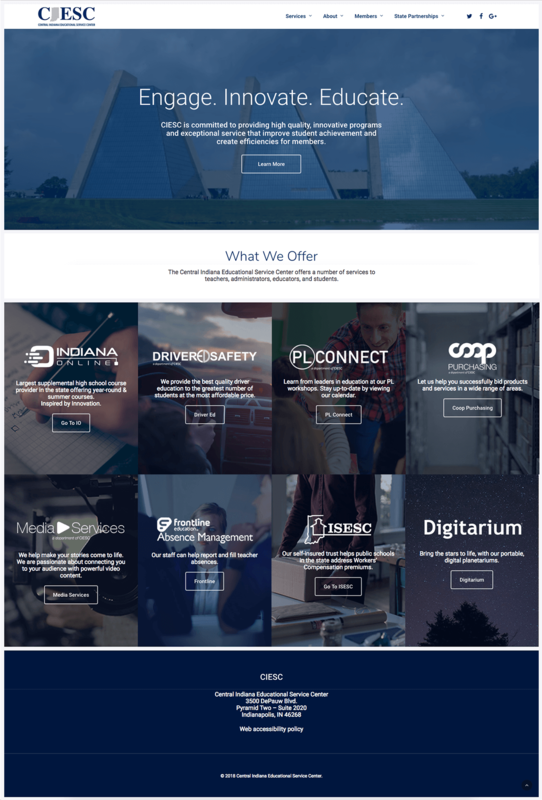 We redesigned the entire CIESC website (with department landing pages) and four additional sites with PL Connect, Driver Ed Safety, COOP Purchasing, and Media Services. Each website has its own ability to create content, resources, and social media promotion.